Have you used any one of the earlier Twister Tools in assorted sizes? Or many Twisters? 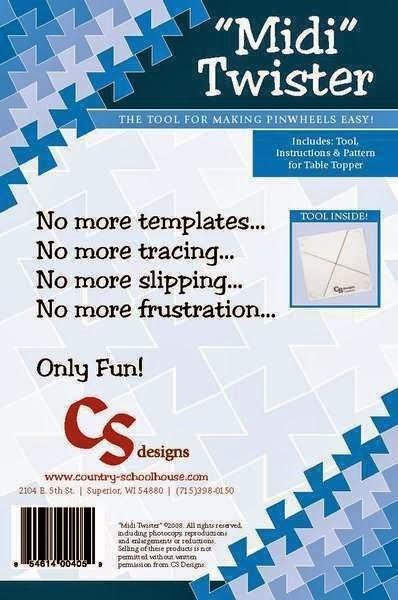 You’ll have the same good time creating fabulous pinwheel projects with the Midi Twister tool. The Midi size uses 6 1/2" fabric squares to achieve the final look. Twisters are new tools that have simplified an old technique with easy to follow instructions. The sky is the limit for projects that you can create with the Twister tool! 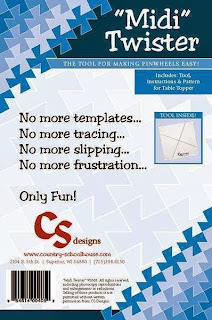 The package includes a pattern for a tabletopper similar to the one pictured below. Numerous patterns are available to accompany the Twister Tools, just inquire and we will point you in the right direction. And then we will all be twistin' the night away! Just a little trivia--did you know that the whole family of Twisters come from the Country Schoolhouse, just up the road in Superior, WI? If you are ever in that neighborhood, you might want to check it out! It should be pretty easy to find, probably right between the corner pub and a cheese factory! You can respond in one of these 3 ways---Call us at 651-429-1039(during business hours), stop in the store, or respond to our e-mail and say "Stuff my Stocking" if you are interested in that item. If you are not on our email list, you can sign up on the website homepage, right in the middle of the page. However, if you e-mail us, please do not send that information in your message. We will call you back at the number you provide to get the information. Each person must have a credit card number to participate this year. Credit card information will be kept in a secure place and will be destroyed after you are billed. You will be billed one time only, at the end of the event. Items can be shipped (excluding liquids) for the amount of the postage, no handling fee. You may pick and choose the items you would like to order. Each special will be offered for 24 hours only. You will need to respond by midnight if sending an e-mail or by end of the business day if calling (hours listed below). Some items will be limited in number. We will gather your items and pack them in a gift bag. You or your Santa may pick up your items beginning December 17. No sooner, please! 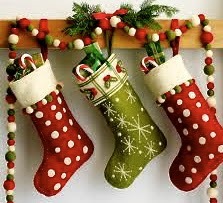 Very important--Don't forget we are closed December 24-25-26. Our Annual "End of the Year" Sale will begin on December 27. Best Wishes From Your Bear Patch Friends!